Can you freeze green beans? Yes, you can…and they taste amazing! 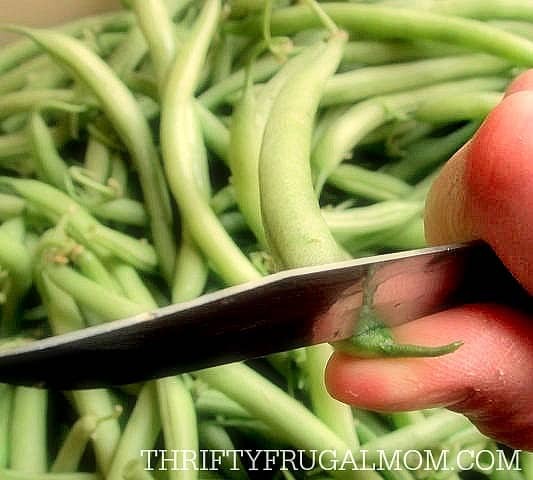 Learn how to freeze green beans in no time with this easy step by step tutorial! One of the ways that I save quite a bit of money on groceries is by preserving lots of fruits and vegetables. While we live in the city and don’t have room for a big garden, we’re blessed to live in an area where we can get lots of beautiful, home grown produce for great prices. So I simply buy large amounts from local growers and then preserve them for us to enjoy all year long. I know that canning and freezing produce sounds really daunting to many people, so this year I’m hoping to do a couple of tutorials to show you just how simple the process really is. Besides, green beans are one of those things that just taste so much better when you preserve them yourself. Just recently I saw a great deal on some frozen beans at the store and decided to buy a couple of bags thinking it would help stretch our supply. I made them for our dinner one night and after one bite my husband commented, “It’s no wonder so many people don’t like vegetables!” And honestly, I had to agree. They just were nowhere near as tasty as the green beans that I freeze! You can preserve your beans by canning or freezing them. If you choose to can them, you need to use a pressure canner since using a regular canner doesn’t reach high enough temps to kill the bacteria that causes botulism. I find the pressure canning process rather time consuming and tedious plus it also makes the beans less nutritious. Did you know that frozen veggies and fruit have almost as much nutritional value as when they are fresh? So, instead, I choose to simply freeze green beans, which you’ll see is amazingly simple to do. Okay, let’s channel your inner Ma Ingals and get started! 1. 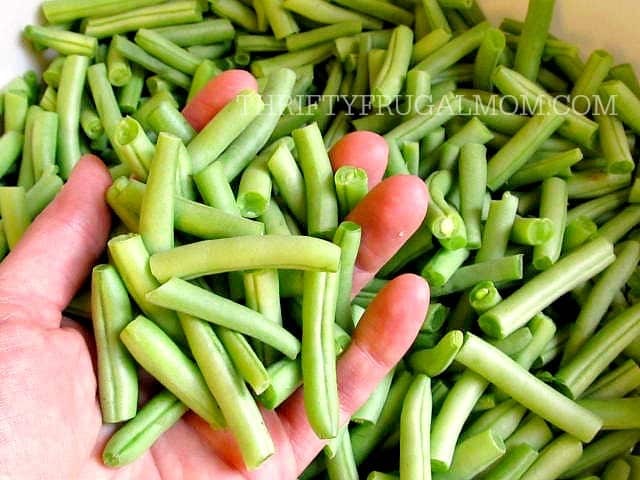 Remove ends and defective spots and if you have true “string” beans, remove the strings too. Technically you don’t have to remove the tail end of the bean, just the end that was attached to the stalk. However, I don’t like the look of leaving them on so I remove them too. 2. Break or cut the beans into 1 to 1 ½ inch pieces. This is a step that even little children can help with- in fact, they often think it is fun! 3. Wash the beans thoroughly. I like to put a dishpan full of beans in my sink and then just fill it with water. Swish the beans around really good to work any dirt loose. 4. Move the beans over to the colander insert of your blancher , filling it to just below the ridge. Basically you want the beans to not go above the top row of holes so that they will be covered with water during the blanching process. 5. Fill the kettle part of the blancher about 2/3 to 3/4 full with water. You don’t want it too full because the water level will rise once you put the colander full of beans into it. Bring the water to a full, rolling boil. 6. Slowly (this is important so that the water doesn’t go splashing out!) insert the colander full of beans into the boiling water. Once you put the beans in, the water will stop boiling. 8. 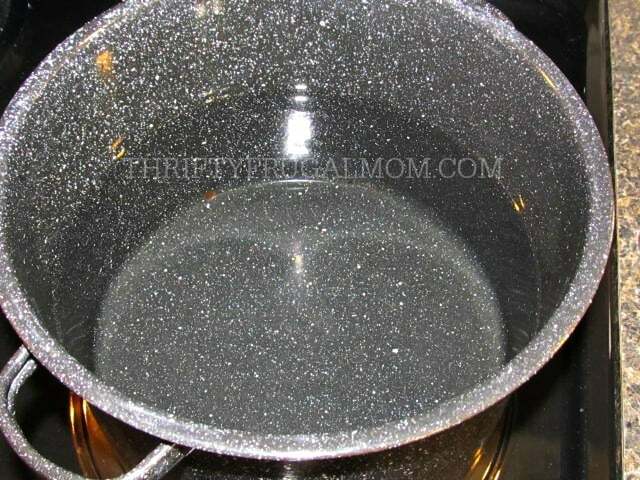 While you are waiting for the beans to boil, draw some cold water (the colder the better) in a dishpan or sink. Once you remove the beans from the boiling water, submerse the colander into the cold water and cool the beans down as fast as possible. 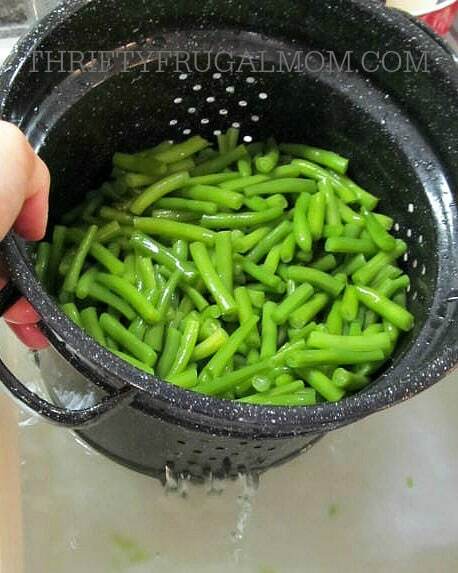 It helps to swish the colander around in the water, keep the water running, use your hands to move the beans around and even change the water if necessary. 9. Once beans are nice and cool, drain the water off of them. 10. 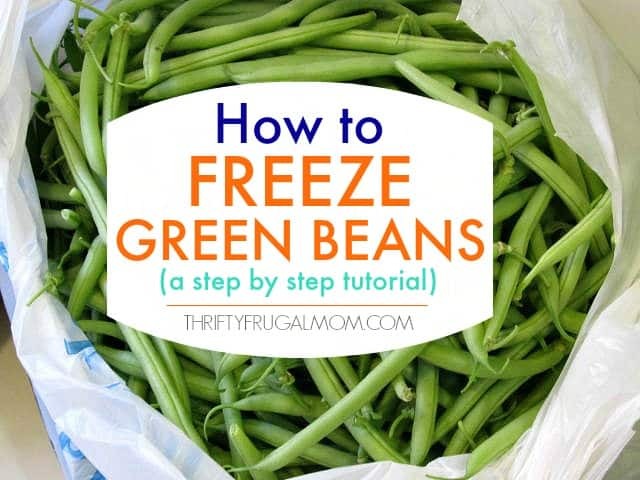 Put the blanched beans in freezer bags or freezer boxes and freeze immediately. I typically use freezer boxes to freeze our food just because I like the way they store and it’s also cheaper in the long run since you can use them over and over and over. And that’s all there is to freezing green beans! So easy, but it produces such tasty beans. Have a question about freezing green beans? Feel free to leave it in the comments and I’ll do my best to answer it for you! I love canning green beans, but I haven’t ever frozen them. I will have to give it a try. When I was a girl I loved swinging with my grandma and breaking the beans. We would just sit on the porch for hours swinging, talking and snapping the beans. I remember my mom doing this but I didn't know how! Thanks for the tutorial. I'll be on it this summer! Oh, it's a great way to save those yummy green beans to enjoy later on in the year, Jennifer! I have never frozen green beans, I pickle them yearly though. When you freeze them how long do they stay good? Is there a recommended time to eat them in? I am the only one in the family that likes green beans, if I could freeze them in small batches I could have my very own stash! Oh, I've heard of pickling green beans, but have never tried it. I'm not a pickle fan, but my husband loves them and would probably enjoy if I did green beans that way. About how long frozen green beans stay good- they should be fine for at least a year, if you use a deep freeze. (I've discovered fridge freezers don't seem to stay as cold and as a result, don't keep things as well.) I've actually had some a little longer and they've been okay too. It's not like they spoil or anything, but the quality might slowly deteriorate. I have been wanting to start freezing more fresh veggies so we don't waste as much. But do these still taste fresh whenever you dethaw them? Stephanie, they taste a bit different than fresh ones, but I don't think it's a bad different. 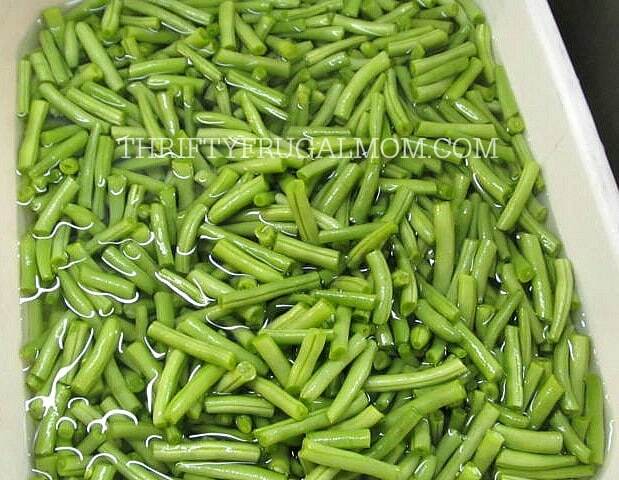 Have you ever had frozen green beans from the store? They are similar to that, only better because the ones from the store usually taste like they blanched them too long. How do you prepare them when ready to eat? You can cook them either frozen or partially thawed. Just add a bit of water (I typically do 1/2 to 1 cup per quart) and salt and then cover and simmer until they are as done as you like them. Some people prefer them slightly crunchy, others prefer them cooked until they are totally soft. Drain the water, and if you want, add some butter and/or other seasonings such as pepper, then enjoy! Great info! Thanks for sharing at Inspire Me Mondays! Glad to hear it, Gwen! I love how easy beans are to grow, harvest and preserve. How long do frozen green beans last? I have 16 bushes of beans growing so I know I won't use them all in a couple sittings. Thank you so much for this!!!!! Tia, I don't know what the official response is, but I've had them in the freezer a year, sometimes longer, and they still taste great! And I'm jealous of those 16 bushes of beans. :) Glad to help! I have always wanted to do this! Thanks! Pinning and sharing! Hello and thanks for the tutorial. Can you please explain why is it necessary to blanch them before freezing? I also freeze green beans but I skip the blanching. Ana, from my understanding it basically helps preserve their flavor, nutrition and color. Here's how the National Center for Home Food Preservation explains it: Blanching (scalding vegetables in boiling water or steam for a short time) is a must for almost all vegetables to be frozen. It stops enzyme actions which can cause loss of flavor, color and texture. Blanching cleanses the surface of dirt and organisms, brightens the color and helps retard loss of vitamins. Hope that helps! Fun! Hope your beans do really well for you. I always think they are kind of fun to pick. I wouldn't know why you couldn't season them frozen, although, I wouldn't do it until you go to put them in the freezer bags. (In other words, don't season them during the blanching process. I don't know if it would hurt or not, but I'd hate for you to try it.) The only downside to seasoning before you freeze them is that when you go to cook them before eating, you might lose some of the seasoning in the water. How long do the beens need to be cooked when they are being prepared to eat? Brenda, I depends on how soft or crunchy you like them! I typically use a pressure cooker to cook ours and I pressure them for 2 to 3 minutes. When I cook them in a regular kettle, I just periodically check them until they are cooked as soft as we like them. Sorry I don't have a more exact answer for you! My favorite thing about the whole post? The pictures! Love seeing all that green because it mirrors my kitchen right now! I have always canned my beans, but aren't beans just a lovely and bountiful gift from God? So you're in the thick of green bean preserving, I take it? 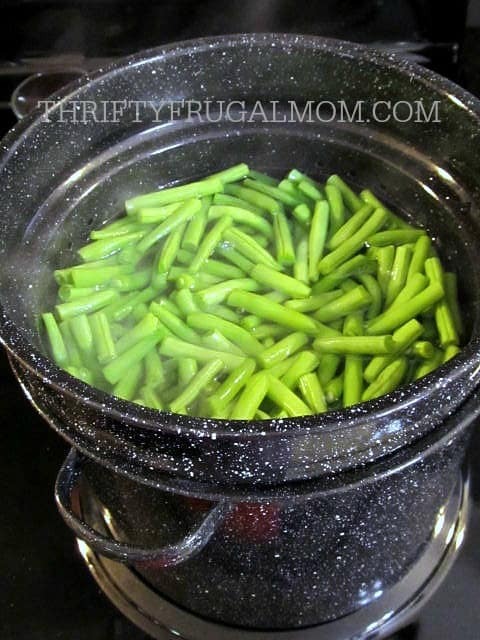 :) Yes, I love green beans and they typically produce so nicely! I like canned green beans too, but since I don't have a pressure cooker to safely can them, I have to stick with freezing them. My hubby prefers the taste of the frozen ones too, so I guess that's an added bonus! This brought back lots of great memories of my grandma canning beans. I'm not sure she ever froze them, though! What a great, frugal idea. Pinning it to come back to later. Thanks for sharing. I'm so glad I'm your neighbor at Women with Intention! Kelsey, I think years ago most people canned them simply because freezer space was harder to come by. I like canned green beans too, but in order to do them safely you have to use a pressure cooker, and I don't own one. So freezing is just easier! Thanks for the tutorial! I'm here from Women with Intuition Linkup. The green beans I planted didn't survive but the okra did and it's coming in in great abundance! I've been rinsing and putting in the freezer till I can get enough to make my okra-tomatoes-shrimp-sausage dish. Any ideas on freezing okra? Many thanks! Pick pods while still young and tender. Trim off stem; wash thoroughly. Okra may be blanched whole or slice in 1/4 to 1/2 inch slices. If blanching whole do not cut into seed section when trimming. Blanche in boiling water for 1 minute for slices or 1 1/2 to 2 minutes for pods. (Water will become gooey with the liquid from the slices. Therefore, some flavor will be lost in the water, but you will be rid of much of the goo with this method!) Okra may be sliced after blanching. To Freeze: Cool quickly and drain. Pack containers and freeze immediately. Lisa, I freeze mine whole (with the ends still attached) after washing, then when I'm ready to use them, I cut off the ends & cut into pieces. 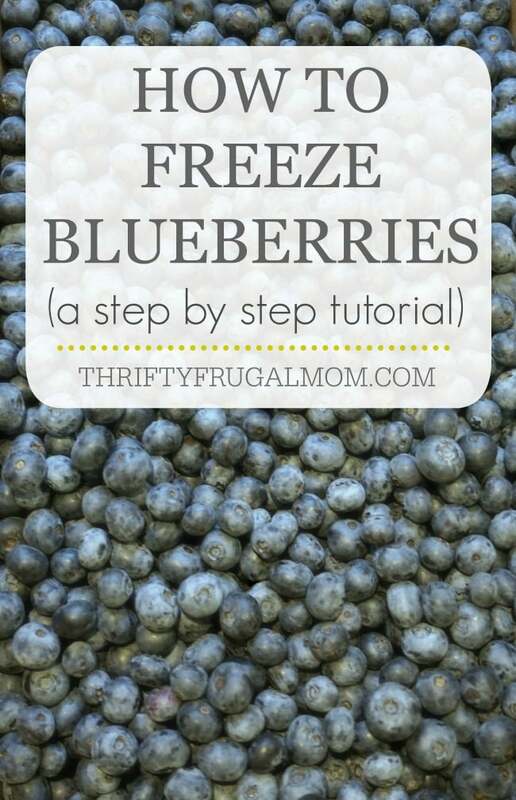 You need to cut them while they are still mostly frozen because if you wait till they thaw they will be limp. We dredge okra in cornmeal & fry it immediately & it tastes just like we just picked it out of the garden. We have done okra this way for about 30 years. I do mine in smaller batches and blanch the beans for 3 min (according to the Ball Canning Book), plunge them in ice water, using lots of ice cubes, drain in a salad spinner then freeze and seal with a Food saver system. Has worked perfectly for 10-15 yrs or more. Sounds like you got your method down, Judy! Aren't beans that you froze yourself so much yummier than the store-bought ones? Thanks for sharing this! 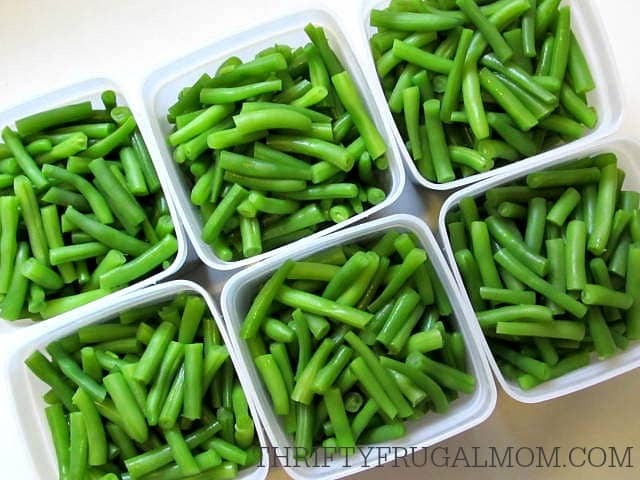 I found a great deal on string beans today, after reading this blog entry last night, and was inspired to buy them and store them! It was a bit laborious, b/c I had a big batch....but your instructions were fabulous and I felt so frugal and accomplished after I finished! I'll be sticking around for more great tips from you! Yay, way to go, Jess! So glad that this could help you out and congratulations on your first time preserving food. :) Thanks for letting me know that you found the post helpful. Will it hurt to season them prior to freezing them....just a little salt and pepper? Brian, it won't hurt anything, but it may end up being a waste of your time, depending on how you plan to use them. If you plan to add water to your frozen green beans when you cook them, then you'll likely also be draining that water off before you serve them and a lot of the salt and pepper will end up going down the drain with the water. If however, you are planning to use another method to cook your green beans, then I think it should be fine. Just wait to add it until you put the beans in freezer bags or whatever containers you plan to freeze them in. 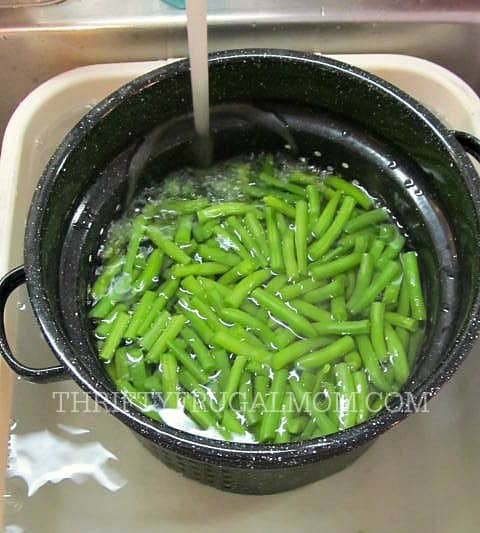 I have grown and frozen green beans for years, but we freeze our beans in the water that we blanch them in, and we have kept beans in freezer for a couple years with no problems. Just thought I'd add my two cents!!!!! Can v not just wash ,cut n freeze instead of blanching them? Sharren, it's not advised. The best way I know to explain it is that blanching stops the process of deterioration, which helps to keep them tasting fresh and keep their nutrition. If you don't blanch them, they continue to slowly deteriorate, even if they are frozen. Right, the state extension service says to blanch vegetables to stop the growth & preserve the freshness of corn or beans or whatever. Frozen vegetables will keep 2-3 years or more in a freezer that is not a frost-free freezer. Most refrigerator freezers & side-by-sides are frost-free for the convenience, so they will not keep the food good-tasting for as long a time. Kathy, the whole frost free thing is very interesting and something that I didn't know before. But it totally makes sense and it explains why things simply don't keep as well in my fridge's refrigerator (compared to my big chest freezer). Thanks for the tips! I like to freeze mine on cookie sheets and put them in large freezer bags after they are frozen. That way I can scoop out the amount I need for smaller meals. That's a great idea, Johanna! 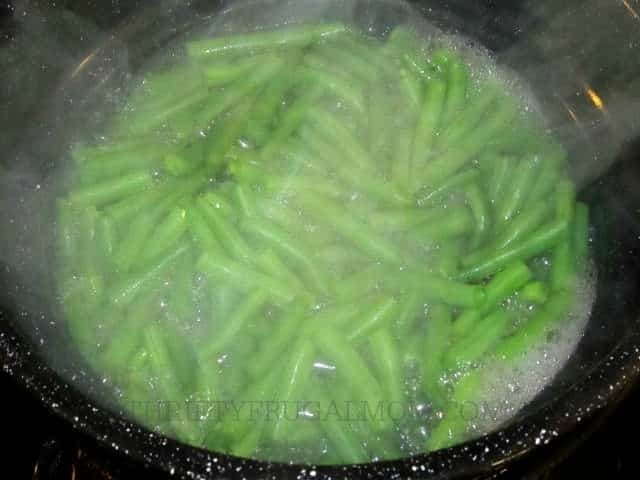 How do you cook the green beans when you are in the mood for some? If I want just plain green beans, I either cook them in my pressure cooker following the instructions that came with that, or else I add about 1 c. water to a pot, add about a qt. of green beans and cook them until they are the tenderness we like, then season them with salt and pepper. They work well in recipes that call for green beans too (BBQ Green Beans etc.) Hope that helps! Why do you blanch them? I cover with water and freeze. Just easier. Blanching them helps them retain their flavor, nutrition and color. Here's how the National Center for Home Food Preservation explains it: Blanching (scalding vegetables in boiling water or steam for a short time) is a must for almost all vegetables to be frozen. It stops enzyme actions which can cause loss of flavor, color and texture. Blanching cleanses the surface of dirt and organisms, brightens the color and helps retard loss of vitamins. Hope that helps! I throw a few snack size bags in the freezer for use in homemade veggie soup during the winter. When cooking just the beans I throw in a little bacon grease and bacon pieces. Delicious!! Love the snack size bag idea! 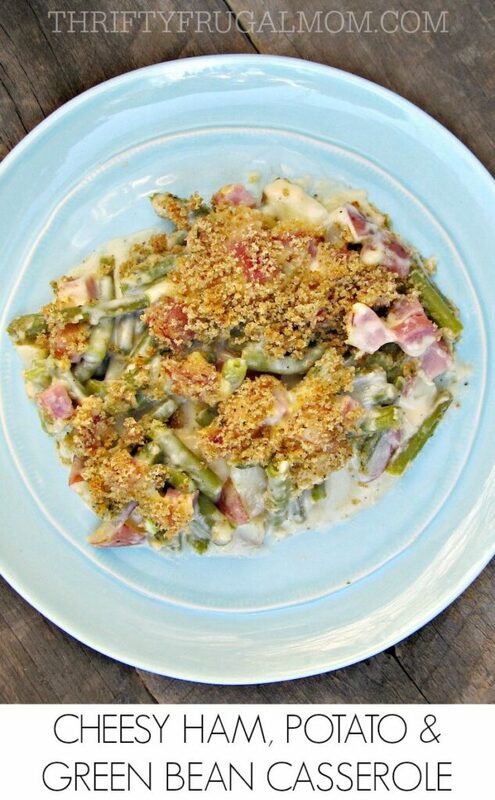 And yes, we love green beans with bacon grease too. So delicious for sure! I know when I pressure can my beans I add salt he jar. Do I add any salt when I freeze them? Yes, when you can produce, adding salt is a good idea. But when you freeze it, it's recommended to just wait to add the salt until you go to cook the beans. I've tryed freezing the beans but they come out like rubber don't know what I'm doing wrong? Oh dear, that is frustrating! When you froze them, did you follow these instructions exactly or did you do them differently. 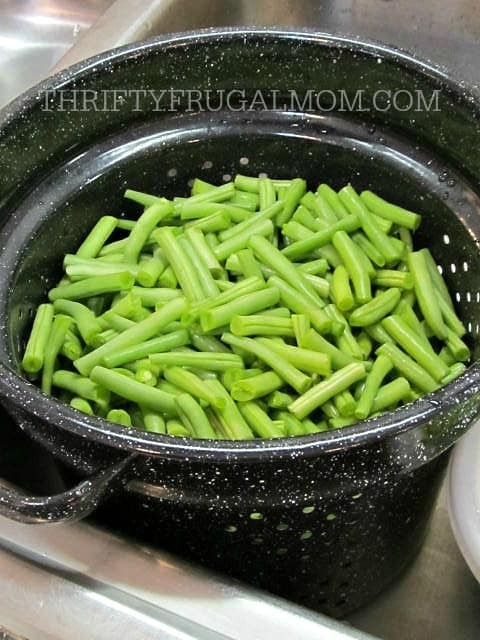 From my experience, rubbery green beans are typically a result of cooking the green beans enough when you go to cook them in preparation for eating. When you are done the processes that I give here for blanching, the beans will still be very rubbery. So, just like store bought frozen beans, when you get them out of the freezer you need to cook them further. How much depends on your preference and the only way to really tell when they are cooked to you liking is often to taste one. The other thing that maybe could be the culprit is that the beans were picked too old. But if that's the case, the beans tend to usually be more stalky and tough, not exactly rubbery. Hope you can figure out what's causing it and are able to enjoy some good green beans soon! I freeze beans every year this way. When I am ready to eat some I don’t put them in water because it takes out some of the nutrients. So I put butter in a sauce pan melt it and then add the green beans cover and cook until done. My mother worked for the University of Illinois and she took classes on how to freeze and cook all kinds of vegetables. I’m glad I payed attention when I was a kid. You can save money by freezing your home grown vegetables. Thanks for that tip, Cindy! I assume the beans produce a little bit of water simply because of being frozen? And what temp do you cook them at? I really like the fact that nutrients wouldn't be cooked away, as you mentioned. Have u roasted the beans after the freezing process? Do they stay crispy and crunchy? We always roast in the oven after we buy them. (With EEVO and garlic salt from aldis). I haven't ever tried roasting them but I just Googled to see if you can roast frozen beans and it looks like you can- just for less time than you do fresh ones since they are already partially cooked. Hope that helps! That's too funny, Susie! It definitely can't hurt anything to keep them on, that's for sure!